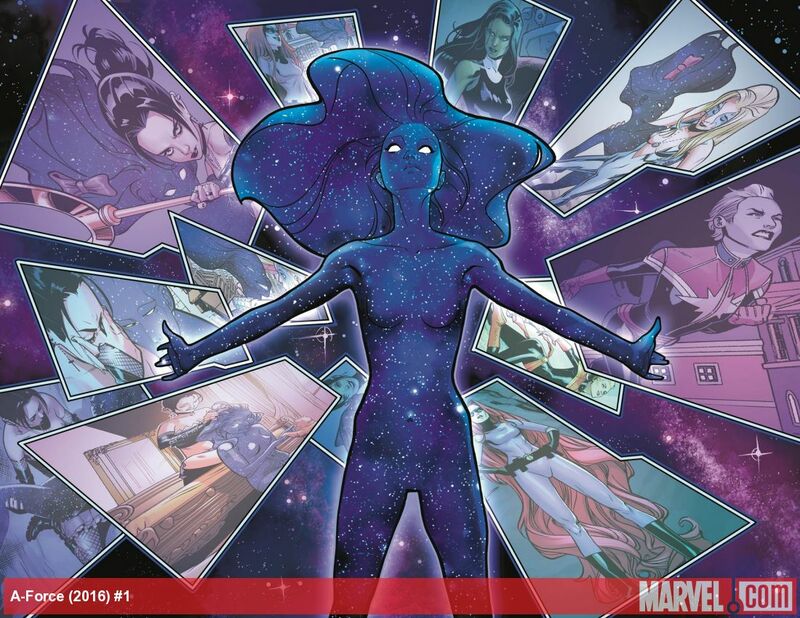 Secret Wars is over and A-Force is back! When A-Force, the all-women version of the Avengers, was announced, I was excited. The fact that it’s penned by G Willow Wilson made it even more exciting. When they announced it would also introduce Singularity, a non-gender-specific character that would have to learn gender and social norms, I was very excited indeed. Sadly, it turned out that A-Force wasn’t really that good—not that it was the creator’s fault, though. They tried their best given what they had to do. Marvel introduced A-Force at the start of Secret Wars, the failed comic event that confused and alienated readers. A-Force was pretty hamstrung and had to follow the Secret Wars plotline. That didn’t go well, and the comic was confusing and lost readers fast. Secret Wars is over now, we’re in a gap between events as we lead into Civil War II, and comics have a little more freedom. A-Force is back. The first post Secret Wars issue has been released, and it’s a little different. Post Secret Wars, most of the heroes don’t know that anything has just happened—you know, Universes collide, wipe each other out, Doom is God, Kittens ruled the skies, that sort of thing. A few heroes remember, though, and Singularity is one of the ones that does. A-Force is again Written by Wilson, with art by Jorge Molina, colors by Laura Martin, and letters by VC’s Cory Petit. The art is good, if a little bland. My only real critique is the fact that so many of the women have the same super thin body shape. The coloring, like the art, is well done. If you saw the Secret Wars run, you know what this will look like. It’s a top-tier Marvel book. Freed from the shackles of Secret Wars, A-Force gets a second chance to shine. Singularity is back, popping back into existence outside the Alpha Flight Space Station. Sensing Captain Marvel, she teleports over, yelling, “Friend!” Only Captain Marvel has no clue who she is, and neither does anyone else on the station—not that anyone has a chance to investigate, as an antimatter creature appears, and Captain Marvel leaves to fight it. Singularity leaves for Earth, but the antimatter follows. Singularity collects She-Hulk, who also has no clue who Singularity is, and the fight resumes. 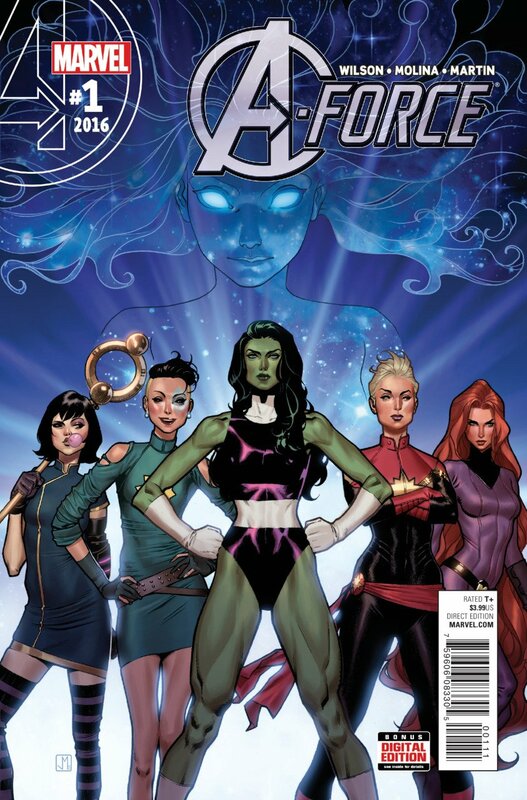 The big question, then: Is this version of A-Force better than the previous one? The answer is a resounding yes. Even with only one issue out, it holds more promise than the Secret Wars arc. I don’t know if it will stay good or not, but I have faith in Wilson, so I have cautious hopes. I really want the all-women Avengers-style team to work. I love She-Hulk, Captain Marvel, and Singularity. This comic has so many of my favorite characters and elements all thrown together. As Mulder would say, I want to believe.